Here we will provide you with background revelations from the making of this book. This section will also have updates and emerald information. You will find paragraphs and entire pages that got cut out of the book simply because of space considerations. Many items get cut out because, although the author thought they were beams of genius, the editor chopped them out and they ended up "on the cutting room floor." They will be revealed here. Such items are still interesting, especially to readers who already have gone through Emeralds, A Passionate Guide and want a greater perspective. Items will be added periodically with the most recent at the top. Notice the tag on the lower right below the specimen: it gives the origin of the emerald specimen as Peru! Of course, in 1533 Francisco Pizarro conquered the Inca capital (in what is now Peru) and sent several boxes of large emeralds to Spain along with gold. 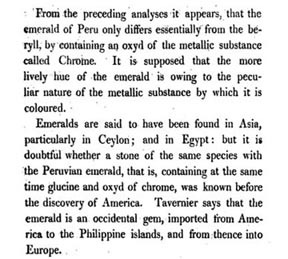 The emeralds impressed King Charles I so much that Pizarro was given the order to discover the Peruvian mine that these emeralds came from. Finally in 1560 it was in present-day Colombian territory, not Peru, where the source of these fine large emeralds was discovered. Because the Viceroyalty of Peru (which included all Southamerican Spanish colonies) existed under Spain for over 280 years, one can imagine how the name Peru could have a meaning broader than its geographical boundaries. Peru, Colombia and many other Southamerican countries did not achieve independence until the early 1800's. So this erroneous tag can now be understood in those terms. This beautiful specimen is now at the University of Rome, Mineralogical Museum; Curator - Michele Macri. The museum employees do not remember when the piece was acquired; one said it may have come from a collection in Austria. In Emeralds A Passionate Guide,page 46-7, I relate the history of the town of Muzo and how it became a major administrative center for the Spanish crown in the early 1600's. They had a large cathedral, a counting house and court houses to serve the Spanish bureaucracy. However in 1650 when Boyacá became a state, politicians from the city of Tunja maneuvered the power away from Muzo and established Tunja as the capital city. 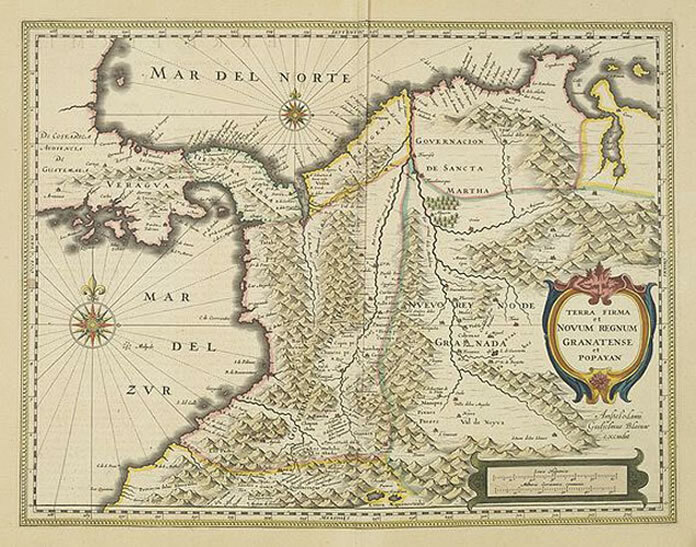 Here at the right is a map from 1629 ("Terra Firma et Novum Regnum Granatense et Popayan") that validates that historic detail by showing Muzo in large letters and the city of Tunja in a much smaller font. Unfortunately the map reproduction does not have a high enough resolution top show you (and I did not have $1200 to buy the map that I inspected!). The mapmakers of the early 1600's obviously were careful to put Muzo in its location and mark it as a major Spanish center. 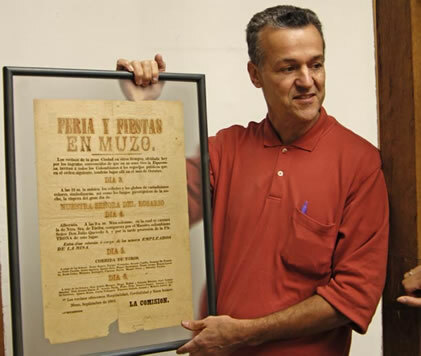 The photo at left shows a poster from 1903 announcing the yearly festivities at Muzo. The first sentence alludes to the bitter loss of power that the town suffered, "The residents of the Great City in other times, now forgotten by the ingrates, convinced that in her bosom still lives hope, invite all Colombians to the public celebrations." The fact that the political defeat suffered by the town is still ruminated long after the fact reveals the proud yet begrudging character of the Colombians from Boyacá. What do see when you look at these two images? Do you see anything similar? The photo at the Left is the image of the main tunnel at the Belmont emerald mine in Brazil. The greenish hue visible may be due to the merury vapor lamps which give off a light that is overly strong at the blue-green end of the spectrum and deficient at the red end. The photo was taken by Marcelo Ribeiro, Director of the mine. The photo at the right was taken at 10x through a microscope at a 3 carat emerald from Colombia. Visible are many white wispy veils and healed fractures. For a discussion of how these inclusions affect the face-up appearance of the stone's color, please refer to your copy of Emeralds A Passionate Guide Chapter 13, page 224. There is quite a difference in appearance when the same stone is viewed under overhead light. Do you see anything similar? The first image captures the elusive Chromium 682nm emission; a phenomenon that only occurrs when the emerald is bombarded with high intensity light - like that achieved by setting the stone on the tip of a fiber optic illuminator turned up full. 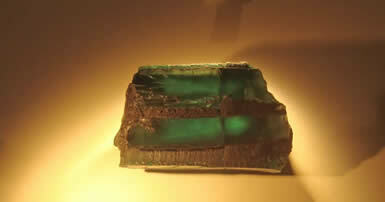 It only happens when the emerald is very transparent and has a high concentration of chromium. In other words, it has to be a fine stone (or a synthetic). This fine emerald eventually sold to Gary Tipp Jewelers in Seattle. (See more details by scrolling down). The Second Image is a picture of what astronomers are calling "The Emerald Galaxy" (also known as RCW 120) photographed by NASA's Spitzer Space Telescope. The rings of hot gas and green glowing dust are beleived to be sculpted by the powerful light of two giant stars at the center. Stunning Discovery in Small Town in Colombia! The volume of undesirable and unsolicited emails, called "Spam," has cost the world untold billions in lost productivity and time. Last month, while passing through the town of Zipaquirá on the way to the emerald mines, I discovered (to my horror!) the source of all of that spam! The picture to the right was taken to document the phenomenon of 682 chromium emission; something that can only be seen when the emerald is bombarded with high intensity light. This only happens when the emerald is very transparent and has a high concentration of chromium. In other words, it has to be a fine stone (or a synthetic). 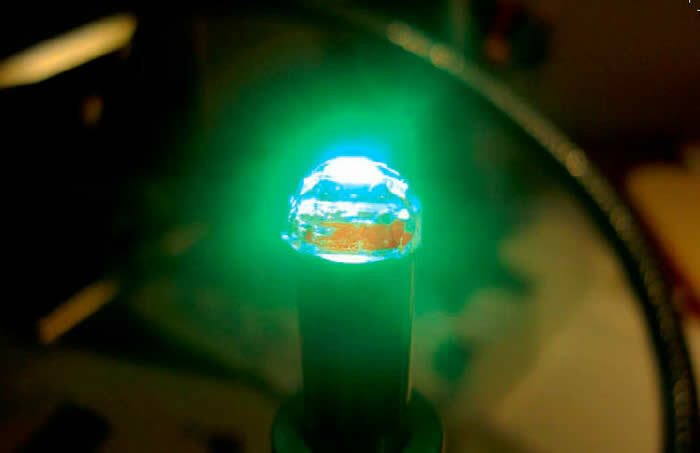 I was very satisfied with the photograph (you can see the fiber optic tube in the background) BUT when I began to take the emerald off of the tip of the fiber-optic illuminator, it was STUCK! The high heat of the intense torrent of light had melted some of the figer-optic glass onto the table of the emerald! Once I pried the stone from the tip, it still had a small bit of fused glass on the emerald (not a good thing for a $7000 per carat stone to have!). Imagine my trepidation as I used a razor blade under the microscope to scrape the surface of the emerald and clean it off. Still, it is a fantastic image: the green light seems to be ejected from the stone and hovering like a cloud around it, leaving the emerald’s interior blue-white like heated steel, with the red emission looking molten! 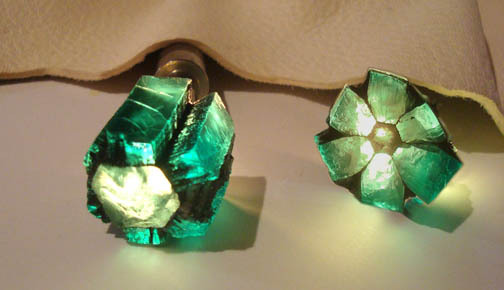 This effect would be impossible in an emerald with too much iron content or not enough chromium. Usually, under normal lighting, the chromium in most Colombian emeralds emits a red that is not visible to the eye except for a mysterious and alluring liveliness in the green color itself. The stone has since sold to a jewelry store in Seattle. The two pieces, purchased in different offices from different owners, fit together perfectly. The color is excellent, with a transparency that makes for a rare piece. The smaller piece is for sale for $7500. The larger piece has sold. 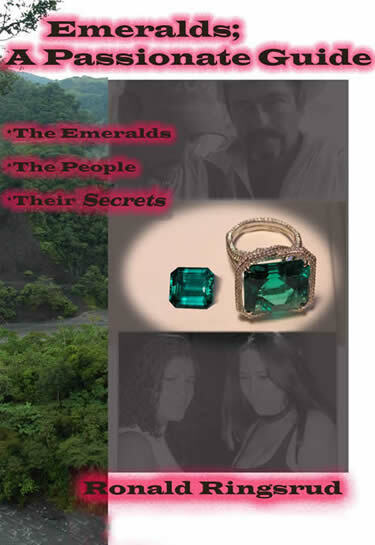 <>Secrets of the Cover -- Everyone loves the cover of Emeralds, A Passionate Guide. Designed by Colombian artist Cristina Lopez, it has generated complements from professionals in the publishing trade to students. Did you know that it only came about at the very end? Did you know that, as the author, I had designed some potential covers which, thankfully, never came about! Here below, behold some of the "almost contenders" for the cover of the book. This cover was the result of a marathon Photoshop session gone wrong. At least you can say it is colorful! The flames inspired me to put the word "ardent" in the title. This was another late night of "creativity"! At the end I went crazy with the font. Writer and gemologist Richard Hughes called it "a B-movie poster!" Luckily it ended up in the trash heap after which I asked Cristina Lopez to design the cover. At least if a B-movie is ever made of my book, the poster is here and at the ready! The buildings along Jiminez and Septima house the emerald offices where comisionistas (brokers) carry merchandise from buyer to buyer. The office of Oscar Baquero is often full with the lively activity of buying. Two Italian buyers were present, with two Colombian buyers and myself all busy among the four rooms and the reception area. Paolo, an Italian buyer and I were passing hours in Oscar’s office, either working by selecting emeralds or waiting to work. In between parcels of emeralds we would make conversation: the American, the Italian and the Colombian points of view always contrasting. Oscar would offer his philosophical viewpoints on everything as well as accentuate certain moments with the lyrics of romantic boleros. It was a long poem. I remember how everyone’s incredulity at such a reading in the middle of a business day slowly changed into personal rapt silence. I sat with my mouth open: I was the practical American businessman concerned with efficiency and time, and here I was listening to Borges! The sounds of ten people outside the office door bothered me at first but soon melted. Emeralds sat in the room, glimmering on their open stone papers. Oscar’s face waas content; it had meaning to it. I became aware of the street sounds from the window. 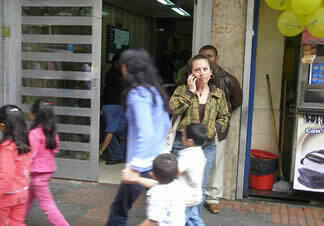 The sounds of the outer office combined with sounds of all Bogotá as the whole world stopped to allow a poem to be read. It was a great moment. It had meaning. <> THE COMPU: This image shows my tired but trusty laptop. This was where the entire book was written. Notice the glue on the left hinge: it is starting to crack at the frame. 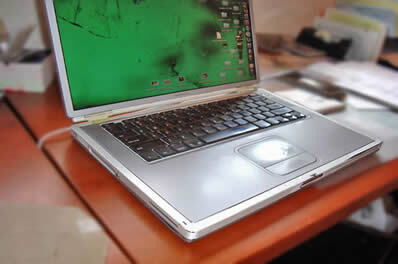 This is a 1G Hz Titanium Powerbook; the last of the Ti Powerbooks. I purchased it for $1800, used, from eBay on January 2004. Now, in 2009 it is really used! The book's final image preparation however, was done on a 24-inch iMac Flatscreen (the one with the ultra-clear glass screen) and Adobe CS3. 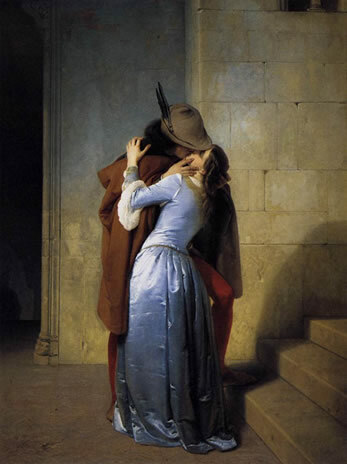 <> THE ROMANCE CHAPTER, PART 2: I really wanted to include this classic scorcher of a kiss painted by Hayez. It captures all the best ingredients: masculinity, desire, tenderness, surrender, passion and a cool feathered hat. Notes on Page 29: As I wrote in the book, the stories in this whole section are true, even down to the name of Lorena's dog. The upper picture on page 25 is the lovely Sandra Salamanca, whose father was an emerald dealer in Bogota's vibrant downtown emerald market. She learned the business from his office, and I must say that I too, learned a thing or two from Señor Salamanca. Sandra can befound often going between the offices of the major dealers at New York's 47th Street district when she is not back in Colombia. thief of kisses is that the punisment for getting caught is often very lenient. The victims of those crimes show hardly any outrage at all! Such punishment is definitely not severe enough to discourage further robberies in the future. 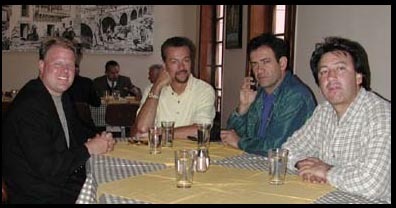 Bruno Fuccini (second from right) at lunch with stone dealer friends in a restaurant in downtown Bogotá. Please send e-mails with questions on any chapter or any story and I will try to give you The Backstory. This image depicts multi-year comisionista known only as 'Chocolatina' in the office of Oscar Baquero holding the book to page 27 where her picture appeared. While delighted to see it there, she said, "I will ask for a copy of the book only when it is published in Spanish." THE NEWS is that the book is being translated right now for 2011 publication into Spanish. 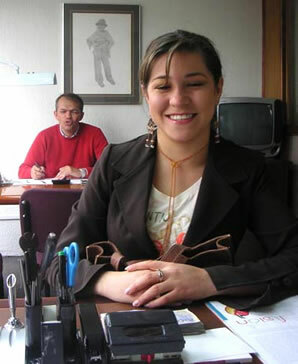 Photographed in 2008 in front of the Edificio America in the emerald district, Adriana now works as an emerald comisionista (broker). In 1989 she gained reknown by surviving a murder attempt and, after recovering from a coma, identifying the perpretators. Later, as told in the book, she was kidnapped by paramilitaries and almost killed again. During the late 1980's there was tension in the emerald district. The mines were fighting among themselves and the rivalry was felt as tension in downtown Bogotá, That tension manifested itself in the form of bank robberies, numerous bounced checks among dealers, and, at its worst, a gang of robbers whose modus operandi was to kill their victims with a hammer in order to get their emeralds and money. After several unsolved murders of this kind, Adriana was attacked in the same way and robbed. However she did not die: she was in a coma for ten days, blind for a month, and then recovered. She was able to put the finger on the men who tried to kill her. Her identification of the gang helped end that dark era in the emerald district. I had heard of this fantastic story years before I finally met her. She now brokers emeralds, raises two children, and still exudes an energy and enthusiasm for life that is delightful and contaigious. Below, you see three images of a modern comisionista in the office of Oscar Baquero in Edificio America. Behind her is Italian emerald dealer Paolo Magnani offering a running commentary of the transaction: I had just bought a small emerald, and rather than the usual 20 day terms for payment, I paid in cash, resulting in a warm smile. and an emerald expert. As an emerald lover myself, I remember reading everything he wrote in the 1980's as I tried to teach myself the intricacies of the emerald. I was impressed when I finally met him and delighted in his refined demeanor and friendliness. 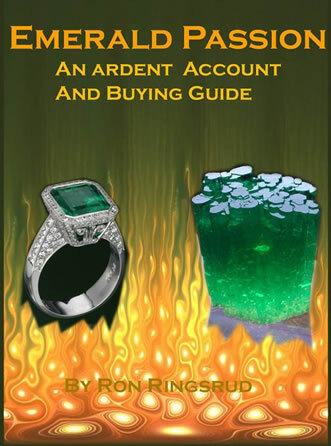 It was immediately apparent that he was a great salesman and a passionate emerald person. This redoubled my desire to be like him. His career was long and rich; encompassing the "good old days" of gem dealing as well as the challenging New Millenium. He will be missed by many people and I send all best wishes to his family. 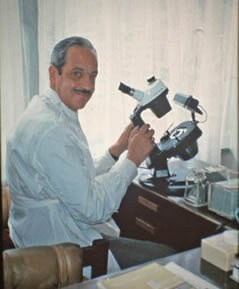 Tribute to Antonio Barriga (1921 - 1990) : Colombia's first active gemologist and author of Esmeraldas de Colombia. In my formative years as an emerald dealer I always encountered him as a fountain of knowledge and an example of consummate professionalism. For several years his book sold in the GIA Bookstore and is now out of print. 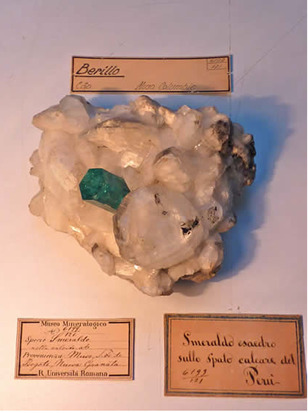 Barriga did the first scientific study of trapiche emeralds and actively collected specimens in the mining region of Muzo.